The Children’s festival is an annual event organised by IIMC in India. It is a day for everyone involved with IIMC to come together to meet, play, dance and eat. Preparations start months before. Thousands of children, women and their families, dignitaries, volunteers both local and international gather for this big festive extravaganza. Each year the festival is dedicated to a different sponsor country. Ivy Silk, the UK coordinator, attended the 20th Annual Festival in January 2015. 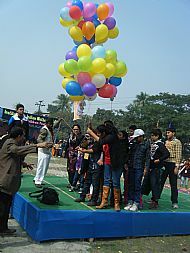 The 20th Annual Children's Festival was held on January 12th. It was dedicated to the sponsors and supporters from Spain. Their coordinator is Dr Jose Muriana Jimenez (Pepe). He was there with his wife Karin. David and Rosa from "The Real Madrid Foundation" were also present. Together they raised the flag of Spain at the festival. Other guests included coordinators from Belgium (Marcel and Marcia), Switzerland (Emilio) and England ( Ivy Silk). Months of preparations that have preceded the occasion have culminated in what was a spectacular day. Almost 4000 people attended the festival - mostly the sponsored children with their families, friends and onlookers. Children who came from a distance spent the previous night at the "Indoor Clinic", a small hospital at the IIMC headquarters in Sonapur. At 7a.m. the programme began with breakfast for ALL!! There were bananas, eggs and breadrolls. Registration started at 9.30am. 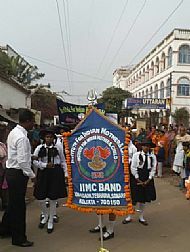 Guests, dignitaries (both national and international) joined the "Peace Rally", following behind the IIMC band. 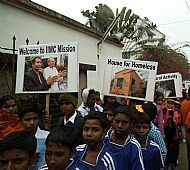 This "Peace Rally" is the walk of a mile from the Indoor Clinic past the modern IIMC Tegharia Outdoor Clinic, where meals would be later served , towards the Inauguration field where the main festival ceremonies would be held. The rally procession arrived around mid-day. The procession marched into the field in a very orderly manner. 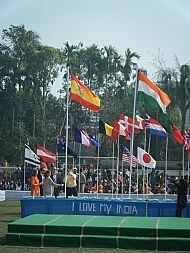 The flags of all the countries who support IIMC were flying all around the field.The flags of India, then IIMC and then Spain, the country for which the 20th festival was dedicated to, were raised. Coconuts were broken, balloons released and doves of peace let to fly. Varying performances took place, with each project of IIMC being represented. Foreign volunteers, made up mostly of medical students, contributed a dance that they had been rehearsing for a week in their spare moments. This, as always, was very well received! After some speeches, all went to the Tegharia Outdoor clinic for lunch. A full Bengali meal was served to all from the foreign volunteers. This took awhile but all were fed (the feeding of the 4000)! The afternoon programme included children's sports and competitions. The evening concert was held in the Outdoor clinic. Many different groups performed with dance and song. A very loud and exciting evening! The day ended with another hearty meal. All went home very tired, but very happy.